This Handbook is an essential reference and a guide to the rapidly expanding field of Geographic Information Science. John P. Wilson is Professor of Geography and Director of the GIS Research Laboratory at the University of Southern California in Los Angeles. A. Stewart Fotheringham is Director of the National Centre for Geocomputation at the National University of Ireland, Maynooth. They are both editors of the journal Transactions in GIS, also published by Blackwell. 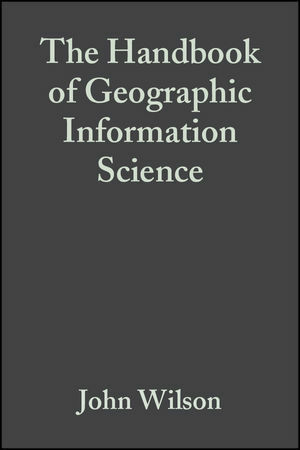 Geographic Information Science: An Introduction: A. Stewart Fotheringham (National University of Ireland) and John P. Wilson (University of Southern California). 1. The Availability of Geographic Data: The Current Technical and Institutional Environment: David J. Cowen (University of South Carolina). 2. Social Data: David J. Martin (University of Southampton). 3. Remote Sensing: Brian G. Lees (University of New South Wales). 4. Spatialization: Andre Skupin (San Diego State University) and Sara I. Fabrikant (University of Zurich). 5. Uncertainty in Spatial Databases: Ashley Morris (DePaul University). 6. On the Identification of Uncertainties in Spatial Data and Their Quantification with Probability Distribution Functions: James D. Brown (Universiteit van Amsterdam) and Gerald B. M. Heuvelink (Wageningen University and Research Centre). Part II: Database Trends and Challenges:. 7. Object-Oriented Database Management Systems: Shashi Shekhar and Ranga Raju Vatsavai (University of Minnesota). 8. Adding the Z Dimension: Michael F. Hutchinson (Australian National University). 9. Adding Time into Geographic Information Science Databases: May Yuan (University of Oklahoma). 10. Geospatial Data Integration: Craig A. Knoblock and Cyrus Shahabi (University of Southern California). 11. Mapping in a Digital Age: William E. Cartwright (RHIT University). 12. Generalization of Spatial Databases: William A. Mackaness (University of Edinburgh). 13. Geographic Information Science and Surfaces: Nicholas J. Tate (University of Leicester), Peter F. Fisher (City University), and David J. Martin (University of Southampton). 14. Fuzzy Classification and Mapping: Vincent B. Robinson (University of Toronto). 15. Rule-Based Mapping: A-Xing Zhu (University of Wisconsin). 16. Multivariate Geovisualization: Mark Gahegan (Pennsylvania State University). 17. Virtual Reality in Geographic Information Science: Michael Batty (University College London). 18. Inference and Spatial Data: Chris Brunsdon (University of Leicester). 19. Geographic Data Mining and Knowledge Discovery: Harvey J. Miller (University of Utah). 20. The Geospatial Semantic Web: Frederico Fonseca (Pennsylvania State University). 21. Quantitative Methods and Geographic Information Systems: Martin Charlton (National University of Ireland). 22. Spatial Cluster Analysis: Geoffrey M. Jacquez (BioMedware, Inc., Ann Arbor). 23. Terrain Analysis: Yongxin Deng (Western Illinois University), John P. Wilson (University of Southern California), and John C. Gallant (CSIRO Land and Water, Canberra). 24. Dynamic Modeling: Jochen Albrecht (City University of New York). Part VI GIS and Society:. 25. Institutional Geographic Information Science and GI Partnering: David Tulloch (State University of New Jersey). 26. Participatory Geographic Information Science: Daniel Weiner and Trevor M. Harris (West Virginia University). 27. Geographic Information Science and Participatory Decision Making: Piotr Jankowski (San Diego State University) and Timothy L. Nyerges (University of Washington). 28. Surveys of People and Place: Peter H. Dana (Georgetown). 29. Geographic Information, Personal Privacy, and the Law: George C. H. Cho (University of Canberra). 30. Geographic Information in Education: Joseph J. Kerski (Denver Federal Center). Part VII: Future Trends and Challenges:. 31. Web-based Geographic Information Science: Christopher B. Jones (Cardiff University) and Ross S. Purves (University of Zurich). 32. Location-based Services and Geographic Information Science: Allan J. Brimicombe (University of East London). 33. Geographic Information Science: The Grand Challenges: Michael F. Goodchild (University of California). 34. Geographic Information Science: Where Next? : Andreas Reuter (European Media Laboratory, Heidelberg) and Alexander Zipf (University of Applied Sciences FH Mainz).